I think OneLotto is a pretty decent lottery site, but it's hindered from rising above most of its ilk by a lot of limitations. 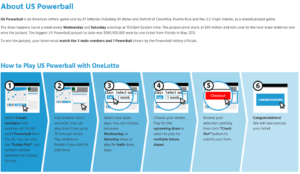 It's a shame that OneLotto's limitations – few payment methods, few languages supported, and lacking game types – drag down an otherwise solid lottery site. They offer 19 games, 5 syndicates, and tons of promotions, for starters. Plus, they also make prize claiming an absolute breeze by depositing your winnings straight to your account. They don't take a percentage from your prize, either. Were it not for the aforementioned missteps, I would have rated OneLotto much higher. Still, it is worth a look. 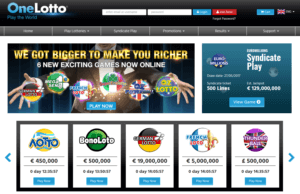 OneLotto is an online lotto agent that purchases tickets on a player’s behalf and offers a secure online lottery experience. Log in to your OneLotto account. Choose the game you want to participate in. You can do this via their front page, or their lotteries page to see every game they have on offer. Lucky Pick 5 lines: This option automatically chooses the numbers for 5 lines for you. Lucky Pick 10 lines: Going with this option means the numbers for 10 lines will be automatically chosen for you. Play Last Numbers: This option inserts the last numbers you played. Note that you need to be logged in/have an account. Choose which draws and how many consecutive weeks you want to participate in. If you are satisfied, click the red “Checkout” button. One of the best things that OneLotto does is that they offer a variety of promotions that can help you save some money. One of the promotions they offer. Deal of the Day: If you purchase 10 lines, you get 1 line for free. That said, with this being a “Deal of the Day” promo, this might change in the future (though they don’t really say if that’s the case). Free Play Rewards: Playing 1 line on any game entitles you to 1 Reward Point, which converts into a Free Play Reward if you reach 25 Reward Points. You can then use the Free Play Reward on any lottery game of your choice. Aside from offering the most popular and lucrative lotteries, OneLotto also offers a few obscure ones. They currently have 20 games on tap, with the usual suspects leading the charge: US Powerball, US Mega Millions, Euromillions, and SuperEnalotto. But that’s not all – they also have quite a few not-so-popular ones as well, like Greek Joker or Greek Lotto. Overall, it’s a pretty good mix despite not being able to match the sheer variety of games offered by some of the heavyweights in the industry. OneLotto beefed up their game offerings fairly recently. OneLotto also offers several group play games, though don’t expect a large selection. So far, they only offer 7 syndicates for lotteries like: US Powerball, US Mega Millions, Euromillions, EuroJackpot, and SuperEnalotto. It’s a bit disappointing that they don’t offer anything more beyond these, but at least their syndicates involve the most popular and lucrative lotteries around. This ensures that, at the very least, you’re looking at the possibility of winning bigger prizes than if they had chosen obscure syndicate games. The only available group play games at OneLotto. No. OneLotto provides a real service in exchange for your money. Yes. OneLotto is certified by ICO, or Information Commissioner’s Office, which is basically a regulatory body officially appointed by the Crown and reports directly to the British Parliament. Yes. OneLotto offers a pretty secured lottery experience, thanks to 128-bit GeoTrust SSL encryption and HTTPS to secure player transactions. Is OneLotto a real or fake company? OneLotto is a real company that first launched in 2008. They have been providing services to players from around the world since then. You can visit their headquarters in Birmingham, UK. OneLotto is owned and operated by Ardua Ventures Ltd., a UK-based internet service provider that also owns Lottery-Millions.co.uk. How does OneLotto make money? OneLotto makes money by charging players a fee on top of the final lottery ticket prices. Yes. Lotto agents are completely legal entities in the eyes of the law. As long as you are from a country/state that permits participation in online lotteries, then you’ll have no problems with authorities as well. Does Lottery Critic trust OneLotto? Yes, OneLotto appears to be a trustworthy company. We have found no evidence to suggest otherwise. OneLotto automatically notifies you if you’ve won, and makes prize claiming a fairly easy process. While results are published on their website 3 hours after official draws have ended, you don’t really need to check OneLotto’s site every now and again to see if you’ve won. They immediately scan every ticket to see if any matches the winning numbers. If you win, they send you an email informing you. All winnings are then deposited to your account wallet where you can withdraw your money. One minor gripe I have with OneLotto is about their prize claiming process, and it’s a little ambiguous. Now, this doesn’t seem like your winnings will be automatically deposited to your account like what they claim (at least for jackpot and 2nd tier prizes). That said, their live chat agent did confirm to me that if you won the two highest prize categories, OneLotto will claim your winnings on your behalf. They will then coordinate with you regarding the procedure for claiming your prize. They should have been more clear upfront, but kudos to their support agent for getting back to me in a timely manner and actually answering my question! OneLotto lags behind their competition when it comes to banking options. Accepted payment methods are severely limited here. In fact, they only accept a measly 4 payment options, namely: Union Pay, Visa, MasterCard and NETeller. This is a problem because it limits the number of people that can play at OneLotto. Sure, these are all popular payment methods, but not everyone uses them. No one will go out of their way and apply for these when they can simply find another lottery site that accepts the payment methods they use. And yes – there are a lot of sites that accept numerous payment methods. Just look at WinTrillions. Has anyone won on OneLotto? There isn’t much information available about any past OneLotto winners, but that’s probably because OneLotto is still a fairly small company compared to other names in the industry. OneLotto, at the moment, does not offer any apps for mobile devices. That means if you want to play on your phone or tablet, you’ll have to rely on the official website. The good news, however, is that OneLotto has done a terrific job at optimizing their service to work on any device. You’ll have no problems playing on OneLotto on-the-go. Overall, you’re getting solid customer support from OneLotto. If you need more assistance beyond self-help measures, you can easily contact OneLotto via phone (which is available 24/7), live chat, email, postal, or social media sites like Facebook, Twitter, and Google+. OneLotto’s FAQs, for starters, are pretty comprehensive and should enough to help you get up to speed regarding their services. You can learn about topics like: Playing with OneLotto, Registration and Account, How to Play, Payments, and more. OneLotto’s lottery education materials are pretty good! Like most lottery sites, OneLotto includes informational tidbits about each lottery in their respective game pages. However, unlike other sites, it takes a few clicks to get to the information as they chose to house them in separate pages (i.e. not everything can be found in a game page). For the most part, OneLotto’s website is pretty easy to use – but some players may find it tricky. Their website doesn’t stray far from the design language that many lottery sites adhere to, so you won’t have problems using it. The latest lottery jackpots and results are displayed front and center, while a quick description of how their service works can be found at the bottom. And up top you’ll find links to the various sections of their website. Even if you are a newcomer to the online lottery industry, you’ll be gliding across their website in no time at all. That is, if you understand English, Chinese or Thai. If not, well, the experience might not be a pleasant one because OneLotto decided not to include language options beyond these two. Of course, you can always turn to Google Translate, but that’s just not a 100% reliable solution. Having an official translation is always ideal. Final Thoughts – Should You Use OneLotto? Give OneLotto a look, but keep your expectations in check. There is a lot to like at OneLotto: decent game variety, zero commissions, various promotions, and an easy prize claiming process. However, several limitations – like lacking payment methods, game types, and language options – prevent some people from truly enjoying their service. It’s a shame, because I truly think OneLotto has the potential to be one of the lottery industry’s greats. For now, however, they are just another decent lottery site. They don’t scan tickets, nor can they provide you a scan of your original ticket on request, which leaves me to believe they don’t even buy the tickets. I would shudder the thought of winning a big jackpot on their site and you have no proof or claim on the winning ticket. Yeah, they’re not our favorite place to buy lottery tickets online. We recommend you check out: https://www.lotterycritic.com/reviews/thelotter-review/. I am using One Lotto for more than a year now and it is always a great and pleasant experience for me. The price per line is the cheapest compared to any other lottery site in the online lotto world, apart from prompt customer service and email notification. The scanned tickets can always be downloaded from my account.